Totally Awesome Hulk #15 Review – AiPT! 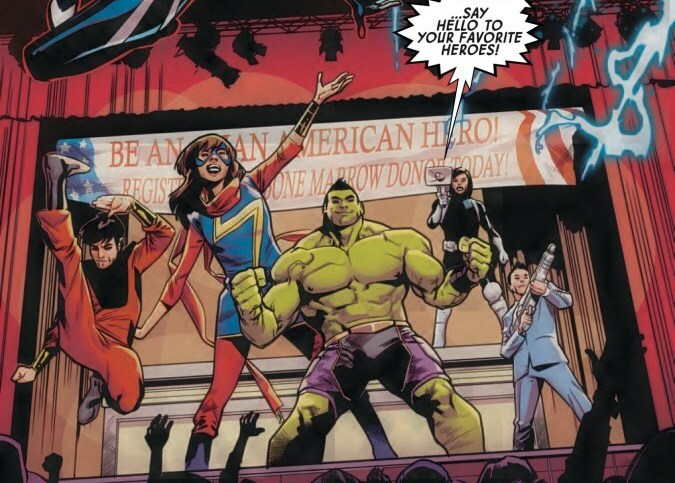 Hulk gets a team up of sorts as he hangs out with Ms. Marvel, Silk, Shang-Chi, Jake Oh, and Jimmy Woo. What can their mission entail? Is said mission good? So what’s it about? Read the preview here. Artist Mahmud Asrar and writer Greg Pak are bringing the feels this issue and establishing the relationships of all the heroes quite well. If you dig any of the heroes listed in the intro then chances are you’ll like this. This issue has a nice bookend that reminds us these characters are superheroes. It then defies expectations, throws in a twist, and relatively feels like a fun hang out you’d want to go on. Pak has these characters go out for dinner and chat. That’s the main draw of this issue as Pak has them talking about Korean food, parents, and more. If you’re Asian American this is going to be your book. It speaks to that culture and with Pak on writing duty, does so in an insightful way. The art by Mahmud Asrar and colors by Nolan Woodard (the credits page by the way shows them listed via icon which is a nice touch) make this issue sing. The character acting is on point. There are panels with all 6 characters and every expression tells the reader something. Mahmud doesn’t skimp, the art is always telling you something or progressing the story. The colors have a naturalness that grounds things in reality. Part of the reason the twists work is due to the full page spreads by Asrar. They blast you in the face with good vibes. This isn’t your standard comic and some might find this boring. I’m not Asian, but I find conversations about culture interesting. Pak is allowing us to look into this world we may not know about and that’s something most comics are trying to do with monsters and aliens, but here he’s doing it with real life issues and culture. How can you fault that? Simply put, there aren’t a lot of comics that are as endearing as this. The characters are genuine and their conversations are easy to follow and enjoy. It’s not a fight comic to say the least, but it’s very well done character drama.